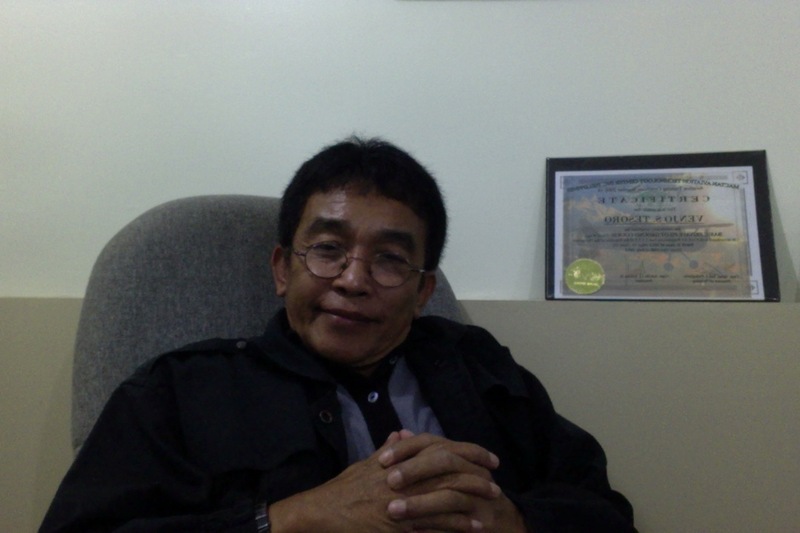 http://www.philippineprisons.com is the site of Venancio J. Tesoro’s reflective notes on the prison service. It is also his journal and diary. Venancio J. Tesoro is presently a retired Penal Superintendent IV of the Bureau of Corrections and has written several books on Criminal Justice Administration (specifically Corrections). He is also an academician, Criminology Board Reviewer, public speaker and a certified lecturer of Penology. In between scholastic commitment, he is also into arts—as a sculptor, wood carver, painter, culinary field and portraitist. He dabbles in poetry, music composition and plays the drum in a musical band. He maintains a regular column “Warden’s Corner” in a newstab (Daily Sun) and also has a weekly radio program (Oras ng Katarungan) over at DXAM 1017 MHZ AM Band in Davao City. His entry in the field of Literature as novelist is a fondest dream that has become a reality. July, 2015, Supt VJT, 61, will become citizen VJT after he retires from the Prison Service. He has served government for 38 years and has decided to pass on the torch to the youthful officers. VJT intends to spend his remaining time in the comfort of his library, read books and publish works on top of fulfilling his artistic, literary, scientific and musical inclination. VJT, since 2012, has transferred and is residing in Panabo City, Davao del Norte. Okay, just let me know how I can help. hi,c aiza 2…this is my nw # po…09303373219..plz call me po..mtagal na po kta gs2 ma cntct po..
e2 din fe accnt ko po..
Great post. I was checking continuously this blog and I’m impressed! Very helpful information specially the last part 🙂 I care for such info a lot. I was seeking this particular info for a long time. Thank you and good luck. I simply want to say I am all new to blogging and site-building and certainly savored this web blog. Probably I’m likely to bookmark your blog . You actually come with superb writings. Many thanks for revealing your blog. My brother sent me here and I’m thankful! I will definitely favorite it and come back! Im so sleepy, but when I visited your blog, it was a sudden rush of blood, because another posts is up. My friend sent me here and I’m happy! I will definitely favorite it and come back! This post is the bomb. You have a new fan! I can’t wait for the next update, favorite! That is the proper weblog for anybody who needs to find out about this topic. You realize a lot its virtually arduous to argue with you (not that I actually would want…HaHa). You positively put a brand new spin on a subject thats been written about for years. Great stuff, just nice! Keep all the articles coming. I enjoy reading via your points. Cheers. This blog site has got some extremely useful info on it! Thanks for helping me! Now can you tell me how to subscribe here? My husband and i ended up being joyous Louis managed to carry out his investigations because of the ideas he discovered out of your weblog. It is now and again perplexing to simply possibly be giving away tips which usually people have been trying to sell. So we take into account we’ve got you to thank for this. The most important illustrations you’ve made, the straightforward blog menu, the friendships you make it easier to engender – it is many overwhelming, and it’s assisting our son in addition to the family know that this theme is cool, and that’s highly mandatory. Thank you for all! you are truly a just right webmaster. The website loading pace is amazing. It kind of feels that you’re doing any distinctive trick. Furthermore, The contents are masterwork. you’ve performed a fantastic job on this matter! This blog is really good. How can I make one like this ? Cool post . Thank you for, writing on my blog man. I shall email you some time. I didnt know that! How did you make a blog site look this cool. Email me if you get the chance and share your wisdom. Id be appreciative! Awesome post . Thanks for, commenting on my blog man. I shall email you some time. I didnt know that! This is a wonderful blog, could you be interested in going through an interview about just how you developed it? If so e-mail me! I really like the subject of this post and I feel that this is a very unique and rare information that you have managed to put together. This article is the bomb. You have a new fan! I can’t wait for the next update, favorite! There are definitely lots of details like that to take into consideration. That may be a great level to deliver up. I offer the thoughts above as basic inspiration however clearly there are questions like the one you carry up the place crucial thing might be working in sincere good faith. I don?t know if best practices have emerged around issues like that, but I am sure that your job is clearly identified as a fair game. Each boys and girls feel the affect of only a moment’s pleasure, for the remainder of their lives. I actually wanted to make a comment so as to say thanks to you for those fantastic guidelines you are giving out at this site. My time intensive internet lookup has finally been compensated with brilliant ideas to share with my best friends. I would tell you that many of us website visitors are undeniably endowed to be in a really good website with many outstanding individuals with interesting solutions. I feel quite privileged to have used the weblog and look forward to plenty of more pleasurable moments reading here. Thanks a lot once more for everything. I enjoyed this! So wonderful that I’m definitely coming back again tomorrow. I really like the subject of this article and I feel that this is a very unique and rare information that you have managed to compile. What a great site this is. Look forward to seeing this again shortly. What a clever site this is. Look forward to reading this again tomorrow. I wanted to compose you a little word just to thank you so much the moment again with your splendid secrets you’ve shown on this page. This has been certainly wonderfully open-handed with people like you to present freely all that a few people might have supplied for an ebook in order to make some profit for themselves, primarily considering that you might well have done it in the event you wanted. These advice likewise served as a great way to understand that the rest have similar interest much like my own to grasp somewhat more on the subject of this problem. Certainly there are thousands of more pleasurable periods in the future for people who look into your website. I’m impressed, I should say. Definitely seldom do I encounter a weblog that’s the two educative and entertaining, and permit me tell you, you may have hit the nail on the head. Your believed is remarkable the challenge is some factor that not adequate individuals are speaking intelligently about. I am incredibly pleased that I stumbled across this in my search for anything relating to this. Wonderful post. I was checking regularly this weblog and I’m impressed! Extremely helpful info specially the last portion I care for such info a great deal. I was looking for this particular info for a incredibly long time. Thank you and excellent luck. I saw something about that subject on Television final night. Excellent post. I similar to the precious data you offer you inside of your articles or blog posts.I will bookmark your blogging site and look at again here usually.I am somewhat certain I’ll find out a whole lot of recent stuff best suited the following! Decent luck for your upcoming! I such as the worthwhile details you provide on your content articles.I will bookmark your blog site and look at once again here repeatedly.I am pretty absolutely sure I’ll learn about loads of recent stuff precise listed here! Excellent luck with the upcoming! It is essentially a cool and valuable piece of info. I’m content which you just shared this useful information with us. Please keep us informed like this. Thank you for sharing. Thank you, I’ve been hunting for details about this topic for ages and yours may be the greatest I’ve located so far. I like this! So great that I’m definitely coming back again later. Thank you for creating my individual students have access for your webpage post. Your kindness will likely be tremendously appreciated. I’ve got some ongoing projects and I wanted all these students help me with it. The only way they could do that was carry out some exploration on the web so as to help make my work more quickly. They came across your web-site in addition to the content material on it, specially this weblog post, seriously helped them to come to good conclusions on factors we needed to carry out. I’ve been exploring for a bit for just about any high excellent articles or blog posts on this sort of area . Exploring in Yahoo I at final stumbled upon this website. Reading this info So i’m content to convey that I’ve a very very good uncanny feeling I discovered precisely what I necessary. I most unquestionably will be certain to don’t neglect this web page and give it a glance on a constant basis. Thank you for making my personal students have access for your web page post. Your kindness will be drastically appreciated. I’ve got some ongoing projects and I wanted all these students help me with it. The only way they could do that was carry out some exploration online so as to help make my perform more rapidly. They came across your web site in addition to the content material on it, specially this website post, seriously assisted them to come to fantastic conclusions on things we necessary to carry out. Thanks so much for writing all of the exceptional information! Looking forward to checking out a lot more posts! Absolutely composed subject matter, thankyou for data . I like this web blog incredibly a great deal so much excellent details. “It’s a poor sort of memory that only operates backward.” by Lewis Carroll. Good post. I learn some issue additional challenging on several blogs everyday. Most commonly it is actually stimulating to discover content off their writers and use a particular factor from their web site. I’d select to utilize some when utilizing content material on my compact weblog no matter regardless of whether you don’t thoughts. Natually I’ll supply you a link in your internet website. Quite a few thanks for sharing. Hi there from Texas! I’m bored at operate so I decided to check out your web page on my cost-free time throughout lunch break. I adore the information you offer here. Anyhow, superb post! I really like your write-up. Hello there I am so glad I located your website page, I truly found you by mistake, though I was seeking on Bing for a thing else, Anyways I am right here now and would similar to to say thanks a whole lot for a marvelous post and also a all round entertaining blog (I also appreciate the theme/design), I donít have time to browse it all at the moment but I’ve book-marked it as well as integrated your RSS feeds, so when I have time I’ll be back to read a lot more, Please do maintain up the awesome job. Appreciate it for this grand post, I’m glad I observed this web page on yahoo. I truly like your article. Nice info.I like all your post.I will maintain visiting this weblog very often.It is good to see you verbalise from the heart and your clarity on this necessary topic might be easily observed. It’s very tough to locate a great website. And I believe I’m lucky adequate to possess come right here. The posts are executing good and full of great insights. I may be glad to maintain on coming back right here to examine for updates! Thanks for the good writeup. It actually used to be a enjoyment account it. Look complicated to more added agreeable from you! By the way, how could we communicate? I’m usually to blogging i definitely appreciate your articles. This article has actually peaks my interest. Let me bookmark your internet weblog and sustain checking for brand spanking new data. Impressive! I am amazed at how nicely you use words to get your point across. I would be interested in reading far more of your function. You will be an ocean of know-how, otherwise how is it possible to write and express your opinion on each subject so effortlessly. Bow prior to you! I really like reading an article – About PRISON WATCH that will make men and women think. Also, thanks for allowing for me to comment! good submit, pretty informative. I’m wondering why the other experts of this sector do not discover this. You will have to continue your writing. I am confident, you have a fantastic readers’ base already! hello!,I like your writing pretty a great deal! share we communicate extra about your short article on AOL? I have to have a specialist on this location to resolve my dilemma. May be that’s you! Searching forward to determine you. An impressive share! I’ve just forwarded this onto a coworker who had been doing a little homework on this. And he actually bought me dinner simply because I discovered it for him… lol. So allow me to reword this…. Thank YOU for the meal!! But yeah, thanx for spending some time to discuss this matter here on your web site. Good Morning I am a student in UST, taking us BS Architecture. I am currently doing my thesis that concerns Bureau of Corrections. It would be greatly appreciated if I will be given the opportunity to ask you some questions. I would like to know where I could reach you other than here. I’d be glad to send you a formal request letter if necessary. how a user can be aware of it. So that’s why this paragraph is outstdanding. Thanks! your blog has been very interesting, seeing it from a different point of view. i have been a regular visitor for the past 6 or 7 years and have seen it from a different angle. on a different note, may I inquire what is the status of prisoners eligible for release under the 2013 code. when will it be implemented? nkita kta kz kahapon sa news po kaya na reseach kta agad..tnx and bye..
you will provoke in visitors to your profile which in turn will result in your profile attracting more followers. I have commented on previous occasions,,,I am helping in Bilibid, Medium,Minimum[an amazing place to see one of the officers outside helping one of the inmates dig the field ready for planting,Oh he said I have an Agriculture Degree so I can help with the gardening here] and Bicutan,with inmates doing public speaking[Toastmasters materials]. Sir, will it be okay for me to get your email? I am an undergraduate student of History from UP Diliman and my undergraduate paper is about the history of educational system in NBP (specifically Dr. Cecilio Penson’s program and the University of Perpetual Help System DALTA’s extension class program). I would like to know the details as to how and why the programs were established and if there are other programs like this in other penal farms and colonies. There may be other questions I would like to ask in the future, and I was hoping to email you my questions so that you may answer at your leisure. My paper is due on May 15 and I hope I can get a reply from you before then. I am hoping for your kind consideration and help. I was released on Parole last April 24, 2015. My case is libel with min sentence of 4mos and 20 days and max of 2 years. I was remitted to jail Nov 7, 2014. I am required to report to Parole office up to my Max sentence. While i was told by BJMP personnel where i was held that by GCTA i could have been freed by July 7, 2015. If I waited for my GCTA i could have been a full free man with all rights restored? While the parole granted to me I have to continue to abide their conditions till my maximum sentence. Why this big discrepancy? Thank you. i enjoy reading your works sir! not just ordinary human-interest stories, its reality at its best! I was referred to this site by a new found friend whom i got acquainted with when visiting CIW. My friend was right, a few notches more and the page is dangerous to follow. Why? Its addictive. Sir good morning I am the counsel of two witnesses in the Bilibid drug trade. Can I get in touch with you for valuable insights? Wow very interesting site.. personally I want thank you sir for sharing your time on running this king of site. This is very helpful for all criminology students…and to those who want to know more the life inside the correction facility. Hey, I saw your article, Quirino District in 60’s on Facebook. You made my day!!! How are you doing? Hello sir. I stumbled upon your blog and I enjoyed reading your entries. If I may, I would like to ask you if there is any reference that I can look into regarding the transfer of a Bilibid inmate to one of the penal colonies, particularly in Iwahig? Any help would be much appreciated. Thank you sir. Hello sir. I stumbled upon your blog and I enjoyed reading your entries. If it is no bother to you, I would like to ask if you know of any reference/guidelines that I can look into regarding the transfer of a Bilibid inmate to Iwahig? Can’t seem to find any information about it online. Any help would be much appreciated. Thank you sir and more power to your blog. Thank you for the very encouraging comment. I can be reached through my email at vjtesoro@yahoo.com or vjtesoro@gmail.com. Regards and have a very fulfilling day.